Meet any Naga family and most likely you will find that at least one of them sings or knows how to play a musical instrument. Yes, we are a musically gifted bunch of people, and we already have renowned Naga musicians such as Nise Meruno, Alobo Naga, Purple Fusion etc. making it big at the international level, including many more upcoming artists. Our love for music goes a long way back from the time when our forefathers started singing folk songs. Today, it has expanded to include a range of genres from rock, alternative, classical, pop and many more. This week, we explore more ways we can help music in Nagaland grow. I am a Korean, and I have been staying in Nagaland for about five years. 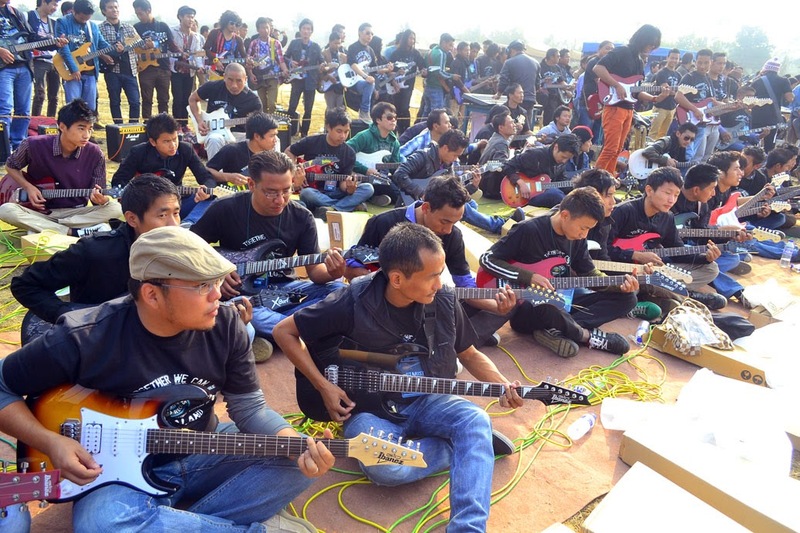 I found that the Nagas are very fond of music, and Nagaland is probably the only State in India to have a Music Task Force to promote musicians. However, we still have a lot to do to cultivate musical interest in our children. In Korea, music is a compulsory subject for elementary, middle and high school syllabus. They focus not only on western classical music but on traditional music too. So when Korean kids start learning music theory at a very young age, they learn to play the recorder, melodeon or accordion which we also call mouth organ. These kinds of musical instruments are found in almost every stationery shop in Korea and they are very affordable. As such, Korean kids can buy the musical instruments and go to school as part of their learning activity. Korea has a lot of places where one can learn how to play musical instruments such as violin, viola, cello, piano, drums etc. Every holiday, Korean parents go to musical concerts or orchestra with their children where they avail opportunities to learn and hear different kinds of music. The Korean Government also encourages its citizens to listen to music, especially when mothers are pregnant, and to play music when the kids are studying in order to help the children to concentrate on their studies. Why then do many Koreans send their children to music institutions when they learn the basics from school? 1. Those who learn music are good in studies and sports: We can see that medical doctors and some mathematicians are good in music. This is because the way one learns about music and the pattern of music arrangements and the way mathematical solutions are placed or arranged are very similar. Thus, the music knowledge helps the students in solving mathematical problem or solutions, because music stimulates the brain and helps the mind to concentrate. A lot of scientists and doctors by profession are good musicians. For example, Dr. Limawati of Naga Chamber Choir is a doctor by profession but he is also a very good musician. In Korea, most medical doctors turn on classical music during surgeries. 2. Music builds patience: In order to learn music, we need a lot of patience and time, so when children start to learn music, they have to understand that learning processes take time. As a result, they learn that practice is a way to perfection. Through this, they learn the value of time and practice; and in course of learning they also develop patience in them. 3. Music controls emotions: When children are growing up, they go through different phases or stages of life. As they approach the age of 17-18, they become fearless. They think they are the best! They want to try out everything and think they can do anything. As such, we see a lot of unguided or misguided children becoming rebellious in society, and they go against the rules, their parents, teachers etc, but when children learn music, they also learn how to control and be intact with their emotions. 4. Music provides social exposure: When children learn music, they also get the opportunity to participate in musical activities. They get to interact with other musicians, as such they develop social skills and also learn to co-operate with other musicians. How About Our Naga Kids? I find that Naga children are very curious, inquisitive, receptive in mind, and very eager to learn new things, especially music. But many children at the grassroot level do not get opportunities to expose themselves to the various opportunities the society offers. As such, it is pitiful to see that many children live in pathetic conditions without availing exposure opportunities. At the same time, many parents are handicapped, without proper knowledge of their environment for obvious simple reasons. I found that Nagas have great musical talents and they do have many traditional musical instruments, but they are not making much headway due to some very simple reasons. 1. Less access to musical instruments: After I came to Nagaland, especially beyond Kohima and Dimapur, I visited some villages. When I went to these places, I showed my mouth organ to the kids and they were so surprised to see it because they saw it for the first time. Nagaland has a lot of good musicians and singers but it is sad to say they have very less access to various kinds of music. When children in Kohima and Dimapur do not have much opportunity to access music, those who are in the villages definitely have no access or very little access to music. 2. Ignorance of parents about the importance of music: Most parents do not think of sending their children to learn music because they have no knowledge or little knowledge about the importance of music. 3. Lack of orchestra and musical concerts suitable for families: Sometime back, I happened to witness an interesting Handel Messiah’s Concert at Ao Baptist Church in Dimapur. They did an amazing performance. I think we should encourage more of such concerts to open the minds of the people to have a broader view of music. This can also help children to appreciate music, and parents too can help their children in developing their potential. These days, there are a lot of popular musicians such as the Chinese musician Lang Lang or Korean composer Yiruma, the composer of “Autumn in My Heart” which many young people are crazy about. These great personalities have not made their achievements overnight. They started when they were still young. While some Naga musicians have made it to the top, and taken up music as a profession, there are still a lot of people and especially children who have no idea about who Beethoven or Mozart or Handel are. When I asked some of our Naga kids who these people were, they were clueless. The world is not so much concerned about who Mr. Narendra Modi is or who Mr. Neiphiu Rio is! But the world knows who Mozart is, who Beethoven is, and who Handel is; and even after several decades people will continue to play their pieces and talk about them. Music has a wide scope and we need to discover and unveil it. Some parents may say, “Oh, my child is too busy with academics and has no time.” While academics is important, it is neither the only thing nor the most important thing. What is important is the all round development of the child. Nagas are gifted with musical talents which need to be developed at a young age to build the interest of the learner. I wish and hope that the Government and different institutions and organisations of Nagaland will see the importance of music and encourage music as part of a learning activity and incorporate it in teaching and learning, not just in the towns and affluent places but also in the villages as well. I am sure we can see great wonders once music is incorporated in the school syllabus in Nagaland. It will not only be a big step, but certainly it will be a big leap. And within the span of a decade, we shall see a big change in Nagaland; Change in knowledge, change in mindset, change in attitude, and change in outlook. The Nagas should also organise more orchestras and musical concerts, give opportunities to schools and churches and also provide aspiring musicians a platform to unveil their talents and abilities. In Korea, we use upright or grand piano to learn. We do not use much of keyboard even though we do not have electricity problem. Even if there is a problem with the piano we can avail servicing easily but it is not the same here in Nagaland. It is very difficult to get pianos repaired, for instance, if my upright piano string is broken, then I have to call up the company in Kolkata or get it from Korea which causes a lot of inconvenience. Musical books are available in some music stores but if they have no stock, then we have to order from Bangalore or other places. In Korea, music is part and parcel of the school curriculum and also of the society, and we have easy access to music instruments and music books. Moreover, the pianos are very risky and costly but I think we should develop our facilities and not just use the piano alone to teach but also provide accordion, or melodeon and different musical instruments. I would also like to encourage the interested people to take up Music Technician Courses. Surely something must be done in Nagaland too in order to equip our people and institutions with proper facilities for learning. that's supposed to be a thumbs-up! Very good.